While proton beam therapy has advanced radiation treatment for numerous cancers, its cost to deliver tends to restrict its application to large research centers. Proton therapy facilities typically require enormous cyclotrons and magnets, multiple treatment rooms, and towering, multifloor gantries that weigh at least 100 tons. Total cost for a treatment center can easily top $100 million. But those costs are starting to come down. 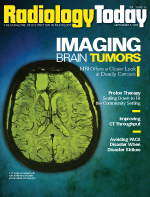 Technology advances coupled with innovative business models are shrinking the size and cost of proton therapy and enabling its initial penetration into community hospital and private practice settings, making the treatment available to more physicians and patients in settings that previously seemed improbable. When the facility that Goad directs, the ProCure Proton Therapy Center in Oklahoma City, opened July 1, it became one of only six proton therapy centers in the United States. It joins a select group that includes the Midwest Proton Radiotherapy Institute at Indiana University, the Francis H. Burr Proton Therapy Center at Massachusetts General Hospital in Boston, the Proton Therapy Center at M. D. Anderson Cancer Center at the University of Texas in Houston, Loma Linda University Medical Center in California, and the University of Florida Proton Therapy Institute in Jacksonville. Unlike the five others, the Oklahoma center operates at the community level. It has taken proton therapy from the research setting and made it available to patients who once would have had to travel far to receive treatment. Established in 2005 by John Cameron, PhD, ProCure developed a turnkey business model that covers proton therapy facility development “from A to Z,” as the founder says. “We do more than just sell or lease equipment. Our business model involves financing the operation, providing building design, supervising the construction, as well as equipment installation and facility management,” says Cameron, who pioneered particle physics at Indiana University and helped create the Midwest Proton Radiotherapy Institute. ProCure’s approach reduces capital expenditure and operating costs. Its building design has a much smaller footprint than the original proton therapy facilities, and the company says its equipment costs 20% to 40% less due to its proprietary technology and relationships with equipment providers. For the Oklahoma City proton therapy center, ProCure worked with the Belgium-based IBA, which provided the center with its compact cyclotron, a model one quarter the weight of conventional cyclotrons. Still River Systems, headquartered in Littleton, Mass., is also developing a less costly proton therapy system. By early next year, the company plans to complete its first project: a single-vault proton therapy center also equipped with compact technology. Affiliated with the Alvin J. Siteman Cancer Center at Barnes-Jewish Hospital and the Washington University in St. Louis School of Medicine, the Kling Center for Proton Therapy is scheduled to open in 2010, according to its director, Jeffrey D. Bradley, MD, an associate professor of radiation oncology at Washington University. Prior to the Oklahoma center’s opening, an estimated 250,000 U.S. patients stood to benefit from proton therapy, but only 6,000 treatment slots were available at the five existing centers. The Oklahoma center alone won’t significantly close that gap but represents a first step toward expanding proton therapy’s reach and reducing its cost. ProCure is busy developing a national partnership network of hospital- and community-based centers. ProCure’s 60,000-square-foot Chicago-area facility, projected to open in February 2010, represents a partnership that includes Radiation Oncology Consultants Ltd (ROCL) and Central DuPage Hospital, a 361-bed facility in Winfield, Ill.
Proton therapy offers more precise control over the radiation energy delivered. The radiation beam deposits most of its energy directly into a tumor. This allows physicians to administer higher, more effective doses while reducing damage to healthy surrounding tissue. In contrast, photons pass through a tumor and even through the patient. The better radiation control helps proton therapy patients experience fewer short- and long-term side effects, less risk of secondary tumors, and an improved quality of life. Clinicians use proton therapy to treat cancers of the brain, head and neck, spine, eye, esophagus, prostate, and breast. Also, because it minimizes long-lasting tissue damage, proton therapy is particularly useful in treating pediatric patients. ProCure reduces the facility footprint by decreasing the number of rotating gantries to a single unit and by innovating advanced incline beam and robotic positioning technology that reduces equipment size, weight, and cost. • a therapy control system that provides the interface to control and monitor equipment to deliver safe and effective treatment. While new technology has notably reduced price, cost remains a significant challenge. Even though the equipment and facility are smaller, a center is still expensive to build, with total costs ranging from $20 million to $25 million. To justify the financial output and meet expenses, these new facilities need sufficient funding and patient throughput. Typically, facilities receive funding from public and/or private sectors, according to ProCure. For instance, the ProCure Proton Therapy Center in Oklahoma City received an initial $70 million funding from energy executive and philanthropist Aubrey K. McClendon, cofounder, chairman, and CEO of Oklahoma City-based Chesapeake Energy Corporation. Also, as part of its business model, ProCure arranges financing and further reduces client costs by investing its own capital resources. With this arrangement, ProCure assumes majority ownership while the client becomes a minority owner. Additionally, facilities need to determine whether they will have the patient volume to generate acceptable return on investment. Both the Oklahoma City and Chicago-area ProCure centers expect an annual 1,500-patient capacity. Until recently, demand for proton therapy among physicians has been small, says Cameron. “Because of the equipment size and cost considerations, many physicians didn’t aggressively pursue proton therapy, as they felt it wasn’t something that would be available to patients. Patients have been more aggressive. They’ve become more sophisticated about treatment options and began asking more questions. We’re helping physicians position themselves to meet the increasing demand,” he says. While ProCure and Still River have developed the equipment and business models to confront demand, training clinical staff to use proton therapy remains a challenge. ProCure includes a training component within its business model and has established a training center in Bloomington. Goad reports that before the Oklahoma City center opened, neither he nor members of his practice group had any experience with proton therapy. But they’ve participated in a training process that includes didactic, lab, and online learning elements. “Training needs to be the next major step in radiation oncology as proton therapy is now rapidly moving forward,” he says.